I certainly hope a white knight (or better yet, a viking) comes and saves this quirky brand from death. 1991 900. Although it looks black, the car was actually a deep gloss blue. Bought it just prior to Allie and I getting married in late 1994 for ~$10k. 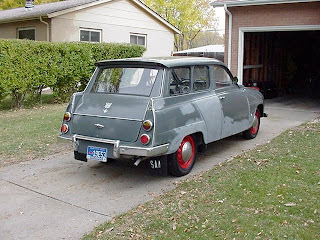 A pretty basic car, fabric seats, no sunroof, cheapo Pep-Boys plastic wheel covers over steel wheels (later remedied by spending $80 at a Motorwerks SAAB for a set of OEM wheelcovers). Traded in for a Honda Del Sol ("Del Slow") in February of 1996 when it started developing some accident-related problems (hey, these were the days before CarFax reports). 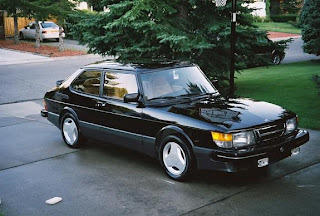 1991 900S, gloss black. 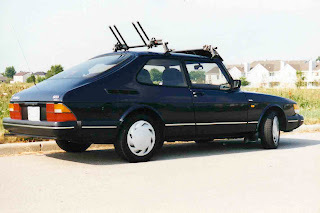 A bit more deluxe than the first SAAB, with a leather interior, alloy wheels and a sunroof. 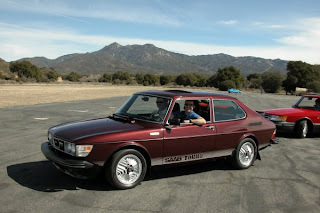 Bought it from a friend for $4k shortly after Celeste was born in 2000 as I no longer wanted a forward-control 1968 VW Westfalia as a daily driver; somewhere deep inside my peanut-sized brain the safety gene kicked in. ...which pushed me into a Honda Accord. 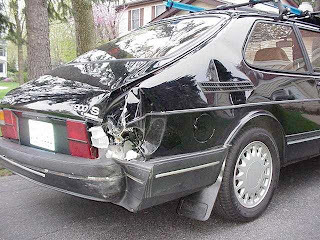 Even though the SAAB had been sandwiched, it was the only car that could be driven away from the scene of the accident. And it drove just fine. Even though the passenger-side door and rear hatch were both unusable, the alignment was dead on and it didn't leak a drop of oil, coolant or any other fluid. 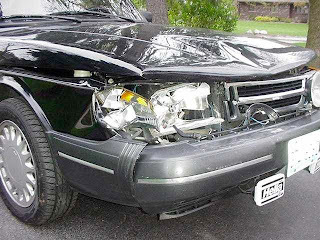 The body shop stopped counting at $8000 in damage and State Farm ended up paying me $500 more than I had paid for the car four years prior. I regret not taking up State Farm on their offer to buy it back for $250. It would have made a hella-fun Hoonmobile at Rancho VonHuben in Waterloo, WI. Replaced with my beloved Subaru WRX wagon. 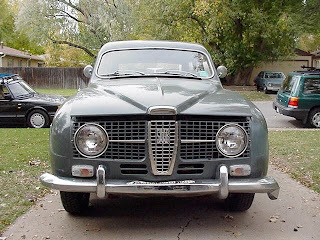 The last SAAB I owned was also the oldest one. 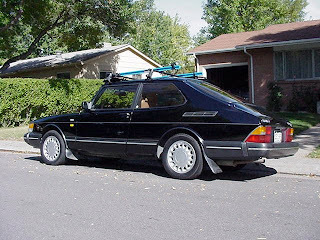 ...this SAAB was acquired in exchange for a Schwinn Cruiser Deluxe bicycle. Yep, traded for a bike. It didn't run well, likely needing a carb rebuild and the brakes sucked. The fuel tank may have had some crud in it as well. Driven all of about 20 miles in total during the two years I owned it and sold once we moved to IL for $900 as I didn't have the time or finances to restore it. Plus even seemingly common parts like a windshield gasket had to be $pecial-ordered from Sweden. 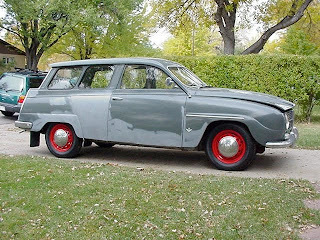 Too bad, the Ford V4-powered thing was cancer free and oh-so cool with four-on-the-tree, a red houndstooth interior as well as a rear-facing third row seat. Yes, this sub-sub-compact was marketed as a seven seater. Take that stupid Chevy Tahoes! 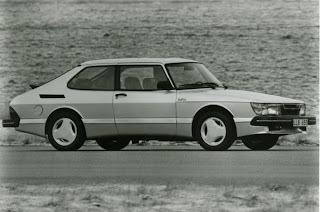 Someday I hope to have a "blunt-nose" 900 SPG in the Swedish wing of my garage. 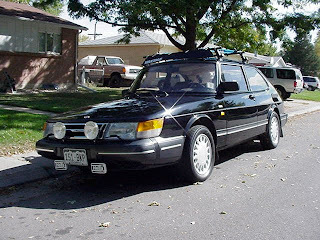 And why not add a 99 Turbo to the mix? 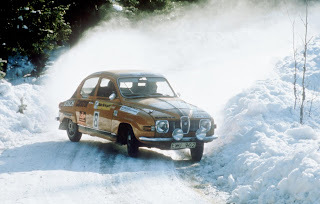 And of course a rally-prepped 96 for blasting around on deserted roads. Shame on GM for royally screwing the brand up during their 16 year ownership.